Middleburg Financial Corporation is a small bank holding company with primary operations in the western suburbs of Washington D.C. The bank’s headquarters are in Middleburg, Virginia. Over the past two years, David Sokol has accumulated nearly twenty percent of the bank’s outstanding shares in his personal accounts. Mr. Sokol is Chairman of MidAmerican Energy Holdings and Chairman and CEO of NetJets, both of which are subsidiaries of Berkshire Hathaway. Since Mr. Sokol is often mentioned as a potential future CEO of Berkshire Hathaway and would be responsible for allocation of capital, we found it interesting to learn of his significant personal investment in Middleburg Financial and decided to take a closer look. Middleburg is located at the southern edge of Loudoun County, one of the most affluent counties in the United States in terms of median household incomes. Middleburg Bank’s main market is on the outer periphery of the Washington metropolitan area in the heart of Virginia’s Hunt Country. Based on personal observations, this is a region characterized by idyllic rural settings mixed with the advance of suburban sprawl during the housing boom. The region has not been spared the impact of the housing crash but recent trends indicate overall stabilization. The area has the advantage of being within commuting distance of the Washington job market which has benefited from the growth of the Federal government. Middleburg Bank has offered banking products and services to the surrounding area since it was founded in 1924. The bank operates seven full service financial centers and two limited service facilities. The bank serves Loudoun, Fairfax, and Fauquier counties and has plans to add a full service financial center in neighboring Prince William County later this year. Middleburg Bank owns a 57 percent interest in Southern Trust Mortgage, a regional mortgage lender headquartered in Virginia Beach. Starting in 2008, Middleburg Bank consolidated the operations of Southern Trust in the bank’s financial statements. Middleburg Investment Group is a non-bank holding company subsidiary which primarily operates in the Richmond, Virginia area under its Middleburg Trust subsidiary. Middleburg Trust offers investment and wealth management services as well as fee based investment management services for clients. In January 2009, the company agreed to accept $22 million in TARP funds through an issue of preferred stock. In December 2009, the company redeemed the preferred stock although the Federal government still holds warrants to purchase 104,101 common shares at a price of $15.85 per share. So far, the story regarding TARP is probably similar to many other small banks in the United States. However, the manner in which the company raised funds to repay the TARP money is where the story gets interesting. From our review of S.E.C. filings, David Sokol first reported a position in Middleburg Financial on November 20, 2008 when he reported ownership of 227,000 shares. On March 31, 2009, Mr. Sokol entered into an agreement with the company to invest $5 million to acquire 454,545 shares at a price of $11 per share. Between March 31 and June 2, Mr. Sokol increased his ownership again. This was followed by market purchases in July and early August. 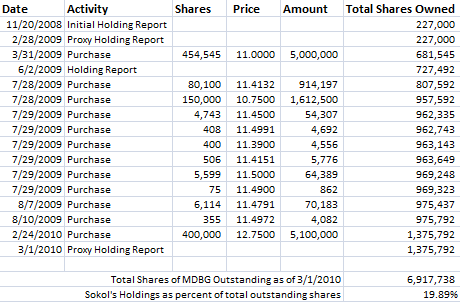 On February 24, 2010, Mr. Sokol purchased an additional 400,000 shares at $12.75 per share. He now owns 1,375,792 shares, or approximately 19.9 percent of the common stock. Mr. Sokol is the largest shareholder by far and owns a stake worth approximately $19.3 million based on today’s closing stock price. In addition to the $5 million raised from Mr. Sokol in March 2009, the bank also issued additional shares in August 2009 resulting in net proceeds of $19.3 million. These funds were used to repay the TARP funds in December 2009. There appear to be no records of any public comment by Mr. Sokol regarding his ownership of the company so some element of speculation is required to determine why he became interested in the company. From a review of the financial statements and through compiling a ten year history, it seems clear that Middleburg Financial enjoyed a strong franchise during the early part of the last decade in which traditional metrics used to value a bank (such as return on assets and return on equity) were very favorable. The bank was able to grow deposits at a satisfactory rate and maintained solid net interest margins. For parts of this timeframe, the bank’s common stock traded well in excess of two times book value. Community banks like Middleburg did not take many of the risks that ended up sinking larger banks. We can see that the bank has experienced higher loss provisions but has maintained profitability and, after the equity raises, has capital ratios that are far in excess of regulatory standards. The cost has been significant dilution particularly over the past year. There does not appear to be any near term catalyst to return the bank to peak profitability. In the latest 10-K report for the year ending December 31, 2009, management indicates that net interest margins will likely contract in 2010 and it appears that expansion will prevent net non-interest expense from declining. One positive factor will be the retirement of the preferred stock which depressed net income available to common shareholders during 2009. In the long run, if the bank can return to a 10% return on equity, it could earn $10 million, or $1.45 per share. This could result in a stock price of $15 to $20 depending on the multiple that is used. However, scenarios in which earnings per share approach this level appear to be at least a couple of years away. On a more favorable note, at a recent price near $14, Middleburg Financial trades only slightly above tangible book value and far below the typical multiples of book value that prevailed during the last decade. At the time of his $5 million investment on March 31, 2009, stock markets were at very depressed levels and it would have been possible to purchase any number of other securities at low prices. For example, an investor could have purchased Wells Fargo at around $14. Berkshire Hathaway was trading around $87,000. Presumably investing in Berkshire was an alternative. The S&P 500 traded around 800. It is doubtful that an investment of this magnitude in a small illiquid bank would be intended either for a short term investment or in anticipation of a small gain. The nature of the investment and the level of risk assumed would indicate that high expectations for long term returns existed. All of these factors lead us to believe that there are forces at work within Middleburg Financial that could result in significant long term value creation that will eventually be reflected in the common stock price. Watching this situation play out over the next few years will be interesting in terms of trying to gain insight into the capital allocation decisions of a potential future CEO at Berkshire Hathaway. 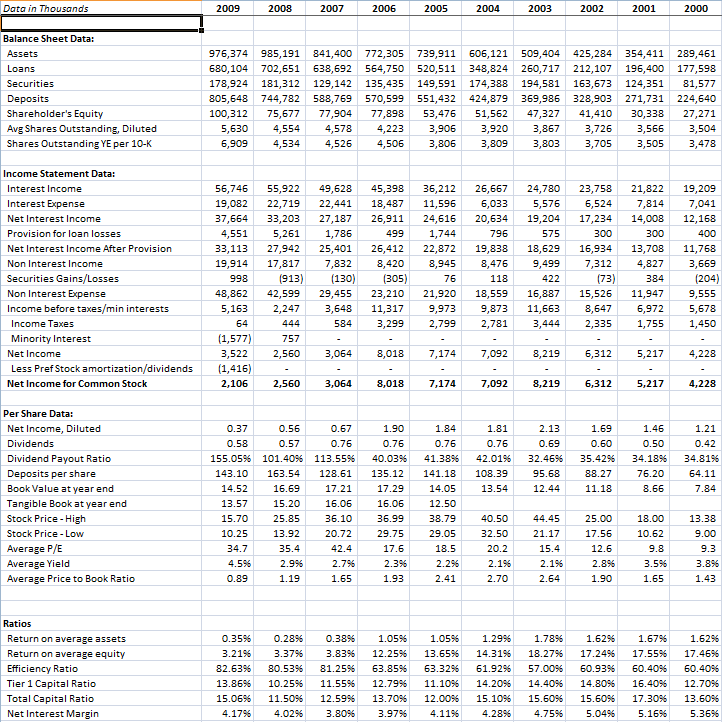 For a spreadsheet with data on Middleburg Financial along with links to S.E.C. filings, please click on this link. Disclosure: The author does not own shares of Middleburg Financial.